China and Papua New Guinea should expand pragmatic cooperation under the Belt and Road framework to provide strong impetus for sustained and stable growth of bilateral ties, President Xi Jinping said on Thursday. 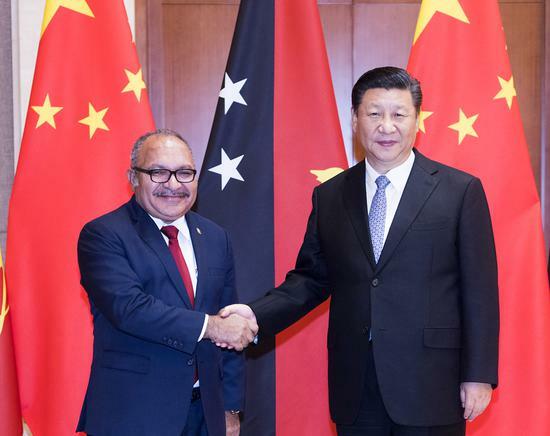 Xi made the remark in a meeting with Papua New Guinean Prime Minister Peter O'Neill at the Diaoyutai State Guesthouse in Beijing. Xi said bilateral cooperation is standing at a new starting point with Papua New Guinea officially joining the Asian Infrastructure Investment Bank and the two countries signing a memorandum of understanding on Belt and Road cooperation, the first of its kind between China and a Pacific island nation. Bilateral ties have been on a fast track of development, and mutual political trust and win-win cooperation have reached a historic high since the two countries reached consensus on building strategic partnerships, Xi said. China appreciates Papua New Guinea's adherence to the one-China policy, and stands ready to step up communication, deepen cooperation and move bilateral ties to new levels, he said. He called on the two countries to increase mutual political trust and extend support and care to each other on issues related to sovereignty, territorial integrity and national dignity under the principle of mutual respect and equal treatment to lay a solid political foundation for bilateral relations. Win-win cooperation should also be promoted to make the cake of cooperation bigger and bigger and trailblaze new cooperative areas, he said. The two countries should deepen friendship between its peoples and expand people-to-people exchanges and cooperation at local levels to give the people of both countries more sense of participation and gain, he said. China is ready to step up coordination and cooperation in multilateral mechanisms with Papua New Guinea, support its hosting of the Asia-Pacific Economic Cooperation Economic Leaders' Meeting this year and jointly build an open Asia-Pacific economy, Xi said. O'Neill said Papua New Guinea speaks highly of the Belt and Road Initiative proposed by Xi and will support it actively. It looks forward to expanding cooperation with China in such areas as trade, investment, agriculture, tourism and infrastructure, he said, adding that it appreciates China's leadership on tackling climate change. Also on Thursday, Premier Li Keqiang and O'Neill witnessed the signing of agreements between the two countries to boost cooperation under the Belt and Road Initiative and in other areas. Li said the bilateral ties have become an example for China's relations with Pacific island countries.